Islamic holidays - There are two official holidays in Islam: Eid Al-Fitr and Eid Al-Adha. 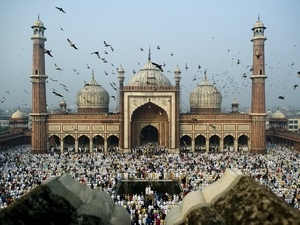 Eid Al-Fitr is celebrated at the end of Ramadan (a month of fasting during daylight hours), and Muslims usually give zakat (charity) on the occasion. Eid Al-Adha is celebrated on the tenth day of Dhu al-Hijjah and lasts for four days, during which Muslims usually sacrifice a sheep and distribute its meat in 3 parts: among family, friends, and the poor. Both holidays occur on dates in the Islamic (Hijri) calendar, which is lunar, and thus their dates in the Gregorian calendar, which is solar, change each year. The Gregorian calendar is based on the orbital period of the Earth's revolution around the Sun, approximately 365 1/4 days, while the Islamic calendar is based on the synodic period of the Moon's revolution around the Earth, approximately 29 1/2 days. The Islamic calendar alternates months of 29 and 30 days (which begin with the new moon). Twelve of these months constitute an Islamic year, which is 11 days shorter than the Gregorian year. Ramadan (also transliterated Ramazan, Ramzan, Ramadhan, or Ramathan) is the ninth month of the Islamic calendar, and is observed by Muslims worldwide as a month of fasting to commemorate the first revelation of the Quran to Muhammad according to Islamic belief. This annual observance is regarded as one of the Five Pillars of Islam. The month lasts 29-30 days based on the visual sightings of the crescent moon, according to numerous biographical accounts compiled in the hadiths. The Hajj is an annual Islamic pilgrimage to Mecca, and a mandatory religious duty for Muslims that must be carried out at least once in their lifetime by all adult Muslims who are physically and financially capable of undertaking the journey, and can support their family during their absence. It is one of the five pillars of Islam, alongside Shahadah, Salat, Zakat, and Sawm. The gathering during Hajj is considered the largest annual gathering of people in the world. The state of being physically and financially capable of performing the Hajj is called istita'ah, and a Muslim who fulfills this condition is called a mustati. The Hajj is a demonstration of the solidarity of the Muslim people, and their submission to God (Allah). The word Hajj means "to intend a journey", which connotes both the outward act of a journey and the inward act of intentions. The Umrah is a pilgrimage to Mecca, Saudi Arabia, performed by Muslims that can be undertaken at any time of the year, in contrast to the Hajj. In Arabic, Umrah means "to visit a populated place". In the Sharia, Umrah means to perform Tawaf round the Kaaba and Sa'i between Al-Safa and Al-Marwah, after assuming Ihram (a sacred state), either from a Miqat like Zu 'l-Hulafa, Juhfa, Qarnu 'l-Manazil, Yalamlam, Zat-i-'Irq, Ibrahim Mursia, or a place in Hill. It is sometimes called the 'minor pilgrimage' or 'lesser pilgrimage', the Hajj being the 'major' pilgrimage and which is compulsory for every able-bodied Muslim who can afford it. The Umrah is not compulsory but highly recommended. The Hijri New Year, also known as Islamic New Year is the day that marks the beginning of a new Islamic calendar year, and is the day on which the year count is incremented. The first day of the year is observed on the first day of Muharram, the first month in the Islamic calendar. The first Islamic year begins in 622 AD with the emigration of Prophet Muhammad from Mecca to Medina, known as the Hijra. The Day of Ashura is on the tenth day of Muharram in the Islamic calendar and marks the climax of the Remembrance of Muharram. Shiite commemorations of the Day of Ashura have traditionally included rituals which have been condemned by many Shia religious authorities recently under the claim that such practices are wrong or unislamic. Mawlid is the observance of the birthday of the Islamic prophet Muhammad which is celebrated often on the 12th day of Rabi' al-awwal, the third month in the Islamic calendar. The 12th Day of Rabi' al-awwall is the most popular date from a list of many dates that are reported as the birth date. Laylat al-Qadr, variously rendered in English as the Night of Decree, Night of Power, Night of Value, Night of Destiny, or Night of Measures, is in Islamic belief the night when the first verses of the Quran were revealed to the Islamic prophet Muhammad. It is one of the odd nights of the last ten days of Ramadan and is better than 1000 months of worship. Muslims believe that on this night the blessings and mercy of Allah are abundant, sins are forgiven, supplications are accepted, and that the annual decree is revealed to the angels who also descend to earth. The Isra and Miraj, are the two parts of a Night Journey that, according to Islamic tradition, the prophet of Islam, Muhammad took during a single night around the year 621. It has been described as both a physical and spiritual journey. A brief sketch of the story is in sura 17 Al-Isra of the Quran, and other details come from the Hadith, collections of the reports of the teachings, deeds and sayings of Muhammad. Bara'at Night or Mid-Sha'ban is a holiday observed by various Muslim communities on the night between 14 and 15 Sha'ban. It is regarded as a night when the fortunes of men for the coming year are decided and when Allah may forgive sinners. In some regions, this is also a night when one's deceased ancestors are honoured. Additionally, Twelver Shia Muslims commemorate the birthday of Muhammad al-Mahdi on this date. Arba'een is a Shia Muslim religious observance that occurs forty days after the Day of Ashura. It commemorates the martyrdom of Husayn ibn Ali, the grandson of Muhammad, which falls on the 20th day of the month of Safar. Imam Husayn ibn Ali and 72 companions were killed by Yazid I's army in the Battle of Karbala in 61 AH (680 CE). Arba'een or forty days is also the usual length of mourning after the death of a family member or loved one in many Muslim traditions.